"E Signature Made Easy! " The thing that I like the most is the templates that come preloaded into the product. So you can easily start a contract draft. You can grab the information from other programs such as Salesforce. It always keeps you up to task on your contracts. You can set up notifications so when your clients have signed their contracts you will be alerted right away, also you can view your documents so you can see what has been signed and what has not. In our office we wish that we would be able to send it to multiple email addresses as opposed to sending the documents to individual emails. If they were to put in a function where emails would merged into the documents easily then it would make all of our jobs a lot easier. Hopefully they take this into consideration and enable multiple emails to be sent at once. If obtaining signatures from clients or anyone for that matter has been a problem or has taken days then this program is a definite solution for your problem. The entire program is very well thought out and I use it multiple times a day. It has completely revolutionized our insurance agencies workflow. Please, for the love of god get rid of the screenshot of the proposal that is in the body of the email that goes out, alerting the signer to the existence of the document to be signed OR make the image link to the actual e-sign document! Our client base mostly have smart phones, but are not tech-savvy enough to know what a thumbnail is. The other issue that boggles my mind is why the signature field and the date field are in two separate drop-down areas. It would be much more efficient to have them right next to each other. For an insurance agency, getting applications signed quickly is paramount to running a professional agency. Before this program, clients were signing in the wrong place every time and faxing all pages out of order. I am so thankful for Adobe Sign (Which I still call EchoSign). "Adobe sign a must for entrepreneurs"
I can't think of anything negative to say. I could say that depite it being easy for people.to use, there are people who can't use.computers as well. I would offer a short video on how to use the app. The biggest business problem I used.to have was the amount of time.it took to find people.to sign the documentation. By using this app I am saving time, therfore that translates to money. I no longer have to run to look for clients to sign documents which can take hours to days, I am able to get things done much faster today. The app is very easy to use as well which makes it easy for anyone to pick up and use as a daily tool in their lufe and business. The efficiency while being able to keep documents secure via internet and how it's more professional to send files this way. I'm still a newer user to this product or any product of this type, so there isn't much I've found to dislike about it. Especially compared the process of printing-writing-scanning-emailing-printing again. The only thing right now that I'd say I dislike is that adding signature boxes can get a little bit confusing to me and I haven't figured out how to ensure I get a copy sent to myself to sign. But, that can always be user error and me being new to the product. It's a really efficient and professional quality product and I'd suggest anyone use it who needs to send professional contracts to clients and other businesses. I used to scan and send new contracts or amendments to contracts with clients and it added in a lot of extra steps and I felt unprofessional sending things this way. I feel like I've really amped up my professionalism levels by using Adobe Sign. It also prevents anyone from tampering with the original documents and it sends to all parties ones it's official. "Customer Service is terrible, Unable to even use the product"
This is the first time I'm trying to use Adobe Sign and it simply doesn't work. I've been kicked off 7 times now over the span of a few hours and told to try again. When I reach out to Adobe via the chatbot on their site, I can barely get a response. I was told I'd get a call when they had an answer. That was hours ago. I'm trying to send a contract for signature. Adobe is supposed make my life easier. Instead it is consuming half my day. Doesn't work. Terrible customer service. Why do they have a product that isn't even on line? I've wasted an entire afternoon trying to get an answer from them. The only reply on their chatbot is that I need to be transferred to a different group. Are you kidding me? It's been 4 hours since I started trying to send a a contract for signature. I want to get a contract signed. I have realized ZERO benefits and have wasted half my day. I'm an Adobe subscriber and I want to keep this aspect of my business with the same software, which is the only reason I'm still trying. "Time saving, mobile devices friendly, security compliance, customizable and easy to use, does not re"
Adobe sign is an e-signature service that lets you sign, send, track and manage signature processes using a browser and mobile device. You can provide signatures by a single click. It works everywhere on all devices and operating systems. Adobe sign has a complex pricing schema. All the features are not readily available in the trial and it works only on the browser. Adobe sign is sometimes vulnerable to hacking and data manipulation. The issues faced with adobe sign are almost rare. If you are always on the go and want to keep a track of all your legal documents then adobe sign is suitable for you as it also provide legal support. Adobe sign is a cloud based e-signature service that lets you use fully automated electronic signature workflows. You can easily sign and manage signature processes using browser and mobile devices. It allows you to manage your work electronically instead of using traditional methods of involving pen and paper. "A great e-signature platform with poor customer service"
The platform is built on a user-interface that features very little intuition or intention in design; creating a bland workflow that can, at times, be difficult to comprehend (especially for a first time user). Creating an online, editable form in Adobe sign can be overly difficult and requires more attention to detail & care than creating a form via Adobe Acrobat. From my experience as well, I was unable to make a form in Acrobat & then upload it, whcih seems rather un-intuitive; however that could be a user error that I am not aware of. Managing the applications settings can also be convoluted and difficult for someone not heavily invested in the e-signature world, and took quite a bit of time to properly understand; especially since some of the advertized features are not available to certain types of accounts (which is not specified anywhere on the website). Furthermore, it can oftentimes be difficult to actually login to Adobe Sign without bookmarking or remembering the URL, as I have had difficulty finding a sign in page for Adobe Sign on the Adobe site. My biggest complaint overall, however, has been the extremely poor customer service; I've been trying to look into upgrading my account to one of their more expensive subscription tiers (in order to unlock certain tools such as embedding forms on a website); however every request for pricing has received no response from their team. "Low effort document routing solution"
I like how Adobe Sign automatically routes documents for signature according to the email order or recipients. I also appreciate that whenever I need to find a previously routed document I can find it automatically filed and saved in my Adobe sign archive. The reminder feature is especially helpful for people who may overlook an Adobe Sign email prompt. I hate that you cannot add in a previously signed Adobe doc (because it is a secure document) into another document being routed. I routinely have to include an Adobe signed doc as supporting documentation to new documents that I am routing for signature but am unable to. I also don't like how difficult it is to make changes to the document once in Adobe Sign mode, but before it has been routed. I route multiple documents a day and Adobe Sign saves time and paper in this task. I like that this is relatively easy to use this platform. It works similarly to how Adobe Acrobat works and now they are integrated! I do not like that they integrated the two programs without explaining. This was confusing the first time I used Adobe Acrobat to send for a signature. My client didn't get the file and I did not know where it went for a couple of days. I finally went to try Adobe Sign again and there was the original document I sent. I think this is a great tool that is now integrated with some of their other products. I think the interface is a little "blah" compared to other products they have but it still gets the job done. I have never had any issues with a client needing help with it which is always great! I can use this when doing projects for someone. I do not work without a signed contract first and this allows a digital signature. This is much faster than printing, signing, and scanning a document! "Adobe Sign is the eSign solution that is simple to use"
Adobe Sign is very simple to use. It is easy to install into Salesforce, and easy for users to get their document going. If you don't have complex templates, this is all you need. It can be plugged into things like Conga for template generation, but if you only need a few fields merged, this is fine to use. I wish their support was quicker to respond to issues. Also, some of the admin features have to be accessed on their site and not just in Salesforce, which is my main focus. If you need a simple to use eSignature solution without needing something more complex then that, this is great and I would recommend it. E Signature has been a god send. We no longer need to deal with the headache of tracking contracts. Adobe does it all! "Simple and effective digital signing solution"
Adobe Sign is simple to use, with a well-designed interface. Buttons are clearly labeled and the workflow is intuitive. There are options provided for more sophisticated forms of user input, such as radio buttons and checkboxes. They could make it easier to upload an image of your own signature. This is possible to do, but you have to have a "user account" in order to do so. It's not made clear whether such a user account counts against the seats purchased as part of your license (last I checked, it didn't). Also, I found it challenging to know for sure whether or not my checkboxes and radio buttons were working properly. It would great if they could add a feature to allow a document to be "test sent" for signature, so that one could verify that it looks to recipients like it's intended to look. We are using this platform to simply and accelerate the process of executing agreements. We have also found it to be useful as a means of written confirmation of expense reports submitted by employees. The benefit is speed and less paper. Pre loaded templates and the ability to pull information from Salesforce. Daily reminders to sign. Email notifications when a document is signed. On the user side. I would like to be able to further control and edit options around tracking and pings to sign document. I would like to be able to use DocuSign as a sales enablement tool. As of now I have to sell the idea of using it as much as I use it. I would like to be able to modify reminder and other email templates. Sets up good contract expectations. While using the application I can import PDF documents or forms directly into it, ready to be signed, save and reply back to the original e-mail within a matter of minutes. Sometimes while using the application it doesn’t seem to be formatted correctly for the 12.9 inch tablet screen that I use. However in the grand scheme of things.. It’s a very small complaint. I would highly recommend this application for anyone who oversees multiple campuses or finds themselves traveling during normal business hours. This small implementation has made my work day more efficient, and allowed me to become more productive overall. Completion of forms and documents on the go or while traveling. This is an excellent solution to needing a printer and scanner in order to quickly return a completed document. "Excellent way to manage signature-based workflows in the digital age"
Like many others, our organization has a history of using paper documents and signatures. Many of our workflows and filing systems are built around this and switching to 100% SaaS solutions are not an option. Adobe Sign bridges the gap by making it painlessly easy to take documents, built workflows around them, and distribute them for digital signature, with the end result being a PDF that can be digitally filed or printed. The only missing piece is some type of mail merge functionality—being able to build a document with custom merge fields and send it to a list of email addresses. I can still build it using Word, and then upload it, but I have to manually send it to each email address. Works very well in conjunction with Acrobat DC. Also has a great iOS mobile app that can allow for local signing on a tablet or device. Sending documents to students for signature, documents that need multiple parties to review, and employee counseling documents. Works very well with the distributed workforce we have in EMS—spread all over the city, working different shift schedules. Allows for truly asynchronous workflows. "It is a trusted name for a legally compliant online solution"
I love the time saved by online signing of contracts. Besides that there's the automatic reminders to get the document signed - some people just need that nudge - and audit trail of when the document was opened and reviewed (in that one case of having to prove this in the small claims court), never mind the paper and postage costs saved! The user interface isn't brilliant - in fact it's clunky and web 1.0 right now. There is no sych with other software - the CRM would make sense, or the Google Drive, the address book... anything. I'd love to delegate my account to my VA but still send in my name rather than her log in as me too. I got Adobe Sign to save time and paper and it does those well. However it was invaluable last year when a client claimed to never have seen the contract and that I had done no work for them, in response to my action to claim the unpaid money they owed money - that was when it really came into its own! "Great value if you subscribe to Creative Cloud"
This is a great solution for companies that can't justify paying separately for an electronic document signature system but are already using Adobe CC. It's fully integrated with Acrobat, and does a fine job of managing electronic documents, including analytics and reminders. Users who don't have a paid Adobe account can still use their free Adobe account to log in and sign their documents. The user interface could use some improvements. The workflows can be a little wonky. If the same person needs to process the document at more than one phase, it records it as if it were two different people. The UI to modify in Acrobat vs. on the Adobe Sign website are too different, which can be confusing. Much easier to get contracts signed when it can all be done online. Also possible to set up a system of templates to cut down on the rework. "Adobe Sign has made work easier! " I love that clients can sign for their forms online. A lot of folks don't have a scanner or even a printer. It can sometimes be difficult waiting for the return of an important document. This program is quick and painless. When I log on, I have to go a roundabout way to get to the adobe sign page. I wish it were more direct when signing into the account. If you need a quick and easy online document sign program, this is the one to use! It will help you become more efficient with your time and energy. It's helping me to be more efficient with client needs. I'm able to get documents signed and returned in a jiffy which helps me perform my job faster. "For creatives this is really really useful!" Easy, straight forward and really useful. Send documents for electronic signature. Getting signatures from clients along the way of a design project can be tricky but because this is all electronic it makes it super easy. Everything is recorded, so you more official time stamps and it help you manage re-request to sign whatever documents you send out. Not a whole lot to be honest. Occasionally you get someone who claims they can't use it but generally its straight forward and easy to use foe even the most techno-phobe out there. Have you contract with T&Cs all signed off at once and easily manage project gate ways, such as specification sign-off, artwork sign-off and project acceptance paper work. All recorded and managed in one place. It make the customer experience slick. "Just as advertised, It Works"
Just give it a try, most softwares nowadays give you a trial time, I believe it will be a good fit for you and your employees because it is a very well known name, so they are not going to have to learn a new software they havent heard of maybe aver, who hasnt heard of Adobe? Echosign is a solid product. We review several similar products, all good, but Echosign seemed to be a cut above. My only dislike is the ability to change the word agreement for every document. I know that a lot of sales people use this tool to close deals, but I work in Human Resources and there are documents that I am uncomfortable using the term "Agreement" anywhere near. Let me change the word Agreement to something else. Trying to go paperless where ever we can. "Standard e-signature software plugin for Salesforce"
Does what it says on the tin. Remote or in person hosted signatures. Setup is relatively light and documents easy to create with mail merge style functionality to drag in variables from Salesforce. The document template is barebones to a fault at points. Sometimes you want a bit of intelligence in your design and that is when you're going to start looking for additional partner products like Conga or a CPQ like Steelbrick. In regards to Salesforce - it is either Adobe Sign or Docusign. You could pretty much toss a coin to pick either. Both do what they say on the tin and in the same fashion. e-contracts. Easy to send out, for customers to sign and the returned documents kick off additional business processes at that point. Good cog in the sales machine. "Simple tool to do things you otherwise couldn't"
Adobe built a very simple app for e-signing documents, forms, bills, pdfs and any other key items. That's it's most basic and banner feature. It also let's you send documents across multiple people, track signatures, and offer in-person secure signing. Per Adobe's suite of cloud-based phone apps, it works on and offline, and will sync with your cloud account. The app itself, I believe, works with the Adobe sign service on your desktop - but does not have to be used that way. The scanning features are of particularly strong quality, they've got better technology behind that than any other app you're likely to find on the market. While they tout their scanning features - and indeed, they are best-in-class for taking a quick picture of your document, correcting color, boundaries and perspective, low-light situations (which are common in the business world) can still get tricky. 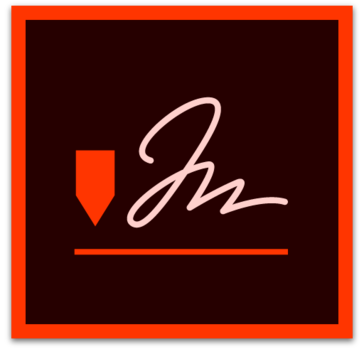 Simple app that integrates with your Adobe CC and makes your e-signing life easier. We use adobe sign for photo releases and any other quick signature-required documents - the fact that it all syncs with our cloud storage makes uploading and storage a breeze - and has really improved our workflows, particularly abroad. "Adobe Sign Is My Go-To For Signing, Creating, & Sending Forms"
The ease of converting existing PDFs into fillable forms or adding in a signature field. I also really appreciate that it stores my signature AND initials so that I can breeze through signing incoming documents electronically. I don't have any major complaints. If I really had to get picky and come up with something, I guess it would be nice to be able to save multiple signature styles to profiles for work vs personal documents. Signing electronic documents quickly, tracking the forms I send out to be signed/completed and being able to do both from inside of one single application. "Easily see everything that needs signing." Adobe sign makes it very easy to see everything that needs to be signed and lays out everything in an easy to access layout. You can start searching right from the dashboard if you know what document you're looking for which is very useful if you're in a hurry as I usually am. Adobe sign feels slow to load when using the mobile web page, I feel like it should be snappier. Adobe sign allows me to easily sign in with my Adobe ID that let's me access all of the Adobe products without having to create another new login or account. This is a Time saver that allows me to get more done as well as makes it easier for me to recommend to people I work with because they probably already have an Adobe ID as well. "Time Saver and Increased Return of Agreements"
The ease of use. After the slight learning curve, it is a very simple software to utilize. We get more agreements back because clients just have to review and click to sign where before they had to print and email or fax, sign and fax back. The pages would often be out of order or missing and we would have a back and forth situation. Now, we set the form up in minutes, click to send and its tracked the whole way through. Nothing to dislike. If they included a way to have an adobe e-sign button inside the most popular programs, that would be a big benefit. For example in Word, or Outlook where we could drop the fields right in from the application, that would save time. Go for it. Once you get used to esigning docs, you won't go back to a fax or email again. We no longer need to send and hope agreements are returned. Clients love its use because they don't have to find a fax or make sure their printer has ink, or wait until the package arrives in the mail to sign and put postage on and then return. Now, we can simply add the fields to the document and choose who has to sign where, set the email address and send. "Great but challenging to impliment"
The ease for which important documents can be signed off and returned has vastly improved internal company management. Being able to know when a document has been completed or is still awaiting sign-off has prevented important files being lost in workload piles. Difficult to change older managers ingrained habits and need for a physical document. Not all staff have the skills or knowledge to use a digital alternative as such consistent usage with our company is a struggle. With multiple other methods available the method often changes based from personal habits. Implement but don't expect immediate uptake by older users. Changing ingrained habits and shifting documentation to digital doesn't always sit comfortable with everyone. Management of documents and streamlining the sign-off process with custom workflows and direct management. Improvements to approval times by making the sign-off and feedback process simple. Documents being lost amongst other work and documents and therefor being overlooked causing delays in production. "BEST SALES REP I HAVE"
FLEXIBILITY: To be able to send the docs to the customer anywhere in the world and they sign for a project happening here in the USA. Give it a chance. Read and learn the product in less than a day. You can master it in no time. Youll use if for everything. I swear. Sales tasking has become much easier and also contracting with sub contractors, etc. we use it for nearly every application at our company. Administration once sent is clunky. I would like to see more work done on the management side of things for documents that have been sent out. While there are lots of features, the messaging sent along with any reminders (for example) could be improved, i.e., formatting, etc. Adobe sign helps our business execute agreements, from HR all the way through to the executive team. It is extremely easy to upload new documents and create fillable forms using previously made word docs, or PDFs. Tracking the path of a document through each step, as well as having the ability to completely manage this document while waiting its signed return is excellent. It’s incredibly intuitive. So much so when I’m sending a document to be signed by someone who may not be very technically inclined they rarely have any difficulties signing and returning my documents! At times there is a longer than expected delay between my recipient having signed and submitted the documents and me receiving them. This has caused some sonfusion in the past as to if they had actually completed the process or not. Well we no longer have to reply on faxbcimily or post to send and receive valid, signed documents. This saves a ton of time and money! The ability to send documents to clients for review and signature . the amount of time it takes tto get them back. I also very much dislike that Adobe Sign and Google Chrome often have issues when sending multiple documents the auto fill will often muddle things up across documents. if you need documents signed on a regular basis this is the way to go. You can send documents and get information back such as the IP address where the form was signed. This alone has helped us verify the location of many of our vendors. quickly and efficiently get agreements signed and contracts completed. Adobe Sign for Salesforce is a great tool for document management direct from your CRM. It's really easy to manage the app install and administration. Having to deal with a managed package is always difficult. Whenever in issue arises, it makes it more difficult to troubleshoot. Adobe Sign is great for managing documents that your customers engage with. It allows us to quickly create relationships within Salesforce so we can see all history associated with our customers and the documents they have engaged with. We are solving the problem of sending and receiving documents to our customers. "Adobe Sign - A Great Tool for Signatures"
I like the ease of uploading my signature template into the program. I like that as each person signs the document I receive a notification, so I never have to wonder where the document is at. I do not like that if a person has not signed the document that they do not receive a reminder email. I have to manually send a reminder. I recommend this product because it is efficient and easy to use. It allows you to upload documents for multiple projects, and it will keep track of all of them in an orderly fashion. I am able to get signed signature pages at a much faster rate. Prior to using this software, I had to scan sheets to individuals, and they would have to print the document out, sign it, and then scan it back to me. I really like the app, it is very easy to use and is convenient since you can use it on the phone as well! The software itself is pretty expensive but is worth it since it saves time by making everything so automated and easy to use. It would, however, still be nice to save a couple dollars. It would be nice if this was more affordable! But this is my only concern. I like everything else about the service we're receiving. We like that we can also reach out to the prviders if we have concerns or need help with anything. It makes the experience so much better! I would recommend getting this instead of some other lower grade services! We have to sign a lot of forms and documents to provide authorization/give consent to certain processes this software makes it easy for many people to sign a single form without having to manually pass it around. "Integrates legally compliant qualified digital signatures with simple electronic signatures." Adobe Sign service functionality, in the "Enterprise Plan 2" version, enables senders to request signatories to use digital certificates. Anyone with a digital certificate and Acrobat Reader (or higher) properly configured on their device can thus be incorporated in an ad-hoc workflow via Sign Service. Signatories need not even have Sign Service licensed or installed on their devices. Adobe Sign Service leaves certain "server processing marks" on documents handled via Sign Service that are not fully recognized by the public validation services for digitally signed documents in Switzerland (validator.ch). Neither is the Adobe Sign service fully aware of validator.ch nor vice versa. As a result, documents with perfectly valid qualified digital signatures processed via Sign service appear to be invalid when checked against validator.ch criteria. 1. Make sure your IT really understands how Adobe Sign Service integrates with e-mail service. 2. If you use digital certificates via Sign service, Acrobat MUST be used as the system PDF viewer. The tight integration of Adobe Sign service with Acrobat is instrumental to how Sign service works with digital certificates. 3. Signatories must have properly configured browsers with up-to-date Adobe Acrobat PDF plugins in order for Sign service to work with digital certificates. Signatories using end-user devices with Acrobat (at least Reader) and browsers properly configured will have no problem using Sign service with qualified personal digital certificates. The difference between a simple "electronically signed" and a legally compliant "digitally signed" PDF document is fundamental. (Only) PDF documents signed with qualified digital certificates, such as SuisseID or equivalent national eIDs, are legally fully equivalent to paper documents with handwritten signatures. At least according to Swiss law (ZertES, OR) and respective laws in EU countries (eIDAS). The compliance of any signed PDF document with Swiss signature law (ZertES), which requires the use of qualified certificates in combination in combination with certified time stamp servers, may be checked via the validator.ch service. This requires uploading (the hash of) a signed document to validator.ch and choosing one of several predefined standards against which to validate the document. Within a few seconds validator.ch will provide a detailed validation report in secured PDF format, which can be downloaded and used as evidence for the validity of the digitally signed document. At the time of this review (Oct 2015) PDF documents digitally signed by multiple signatories using qualified personal certificates via Adobe DC eSign Services show certain "Adobe DC eSIgn server processing marks" which are not recognized by the standards defined in the current implementation of validator.ch..
Work is currently in progress to ensure that public validation services such as validator.ch adequately interpret the presence of such processing marks. The objective is for anyone to be able to check the validity of a digitally signed document against validator.ch (and similar national public service sites) and get instant verification for the validity of the signed electronic document in form of a downloadable validation report in secured PDF format. The ease, speed and teacking of internal documents requiring formal approval by more than one person is greatly improved. Senders can incorporate practically any recipient as a signatory. In principle, signatories need to have no more than a properly configured Adobe Reader (V9 or higher) and a qualified personal digital certificate (or equivalent signing service) in order to participate in business transactions via Sign service. This dramatically shortens the time to complete the signing of documents by multiple signatories, particularly in business transactions involving geographically dispersed individuals from more than one organisation. Benefits from digitally executing business transactions are mainly due to reductions in transaction cycle time and improvements in quality through document process monitoring and control. "Works at a very basic level and there is no support nor flexibility"
Interface, rendering, lack of support, price. Poorly coded and live performance are even worse. Look for other services that are actually selling a finished product, Adobe Sign is at it primitive alpha stage still. Totally worthless! "Not a good real estate solution"
This product was adequate for uploading a newly scanned pdf, adding fields and sending the doc out for signature. It had a document merging feature allowing you to attach multiple independent pdfs to one correspondence and reviews from my test clients indicated a smooth and easy mobile phone signature process. Now the important stuff. Adobe is the designer of pdf infrastructure. What does this mean for e-signatures? All permissions encoded into the pdf are enforced. The adobe sign interface allows the creation of templates, SORT OF. Like the statement above, you cannot remove a page from the template once you have added it. (One additional point. You can upload a doc that cannot be forwarded due to permissions into the template interface as well. So you lovingly create it, save it and when you need it you will NOT be able to forward it.) In my case, a template may be 20 pages with over 50 prefill fields. If one page of the doc is changed, one will have to recreate the whole template. The one last thing I would like to mention is that the initials function is not dated. There is a way in the application to add a manual date log field and assign to the individual initial field, but this requires adding 2 additional fields and then moving and resizing. Seems like a small thing, but over 20 pages, it is 40 extra fields. Generally speaking, I would not use the products for template orientated tasks and I would change my workflow to ensure that I would always upload freshly scanned pdfs into the system. Upload only newly scanned pdfs into the product. Forwarding prior signed electronic docs is very problematic. This product was too cumbersome for my business. "Basic and easy contract tool with limited management visibility or access"
Easy to add and use new contract templates, secure, trackable. Integration with CRM system that allows most of the work to be done within CRM. Great for a company that has basic e-sign needs. Cannot edit or append file names after signature, very limited accessibility (only the user that has sent the contract can access unless complicated advanced sharing measures are taken, which are still very limiting- even then, cannot edit and resend on behalf of user), cannot bulk download. Support is not helpful/does not seem to have much of a desire to help resolve issues quickly or completely. Reporting is lacking. Ability to get many contracts out and returned at one time, and access via CRM. "Adobe Sign is a great way to offer esignature to your customers"
The feature I find the most helpful in this app would be the available audit details. In our previous homegrown esignature app, we did not have this level of control over who signed and when. It was a big win for us to have this offered right out of the box. The only dislike here, and it's a minor one, is the lack of ability to attach docs or sheets to the document being sent out for esig. it seems to merge directly into the doc, which is not what we would want as a company. Otherwise, I have no complaints with Adobe Sign. Definitely worth looking at Adobe Sign when considering an esignature app. Have been very happy with the app and the support from Adobe when needed. We moved from a home grown esignature application to Adobe Sign, and in doing so, have increased our global esignature numbers substantially. The ability to roll out to a number of countries who didn't have access to our homegrown app has been a hug win for the company. It also saves us development costs of having to support our own app. "Useful for HR, but not very intuitive." I think that the ability to repeat the same field on multiple pages makes it easier for the signer. Plus, i can export the data collected in the form, so if I had the programming ability, I could link it to my HRIS and automate the data input. When you create a template using multiple forms, I do not have the capability to separate them later. For instance, my new hires complete their benefit forms using one template that populates their name, address, SSN, etc into all forms once the first field is completed. Once I receive their completed and signed forms, I don't have the ability to separate them so I can send them to enrollment. I have to use a back-end method by opening the PDF in Chrome, printing it to a new file (to remove the security), adding top-level bookmarks for each form, then splitting the document using the bookmark names as my filename in output settings. This is a lot of steps to get to the same desired outcome. I also don't like the fact that I have an Adobe Business subscription with eSign, but I have no clue how to embed the forms on my website (the first listed feature on the subscriptions page) and nobody at Adobe knows how to either. Make sure if you sign up for the business plan you're aware that you have to already know how to perform most of the functions to make use of them. I'm converting my HR department to a paperless office and love the functionality of the paperless process, I've seen faster onboarding and benefit enrollments as well. "Adobe Sign is good, but could be better. " Adobe Sign takes out the unnecessary steps in signing paperwork. It is no longer necessary to print, sign, scan, and send. Rather you can just download the form, sign it, and send it right from the app. Adobe Sign is useful in some situations, but not every situation. My least favorite feature, or rather lack of feature is the app is missing a feature to add a "date." This field is critical when signing documents. Thankfully you can use the initial insert as a date, but then you have to re write it each time. That "solution" though is no fix, it is inconvenient to say the least. Any time I actually want to use the initial feature, I have to rewrite my initials each and every time. Adobe Sign isn't anything special, it does the basic job it says it does, and nothing else. Adobe takes the work out of signing work documents. It doesn't really solve a problem, but rather it takes a simple task and makes it easier. "the most complete signing solution"
Above all, adobe sign is the most complete solution if you're looking into digitising your contracting, sales funnel, or other paperstack you want to get rid of. It's robust, great to use and professional looking to the parties receiving your contracts! All that comes with a competitive pricing as well! The template engine is a bit cumbersome and slow, so creating a new document is a lot of trial and error. The rest works like a charm. I think it comes down to preference what signing solution would work for you. Some like it simple, some like it more complex. Adobe offers a bit of both, with different licensing options. We took the business one, and are happy with the offering. The API is also nicely done and written to allow to pull and push data easily, a big thing for us. we wanted to move away from paper signing in Germany. Adobe Sign fits the bill, needs and workflow fitting to our companies processes well, and with great pricing to boot! "Great software for small and complicated tasks"
This is quick, easy, secure, sharable, manageable, and keeps records for you. The documents are always retrievable if you then again later. The only criticism I have is that for the signer, it can be confusing depending on the device they are using and the screen size. The type your name here isn't always immediately visible, nor is the send button to finish. Ability to return signed documents is crucial to my business in my role here. This eliminated the need for our clients to print. It has been huge. "Un programa demasiado bueno y útil"
Me gusta que permita firmas electrónicas. Los formularios son fáciles y simples de completar y permite la firma y el envío sin complicaciones y se pueden realizar en minutos. Algunas personas no saben cómo usar el programa. Gran programa que permite la eficiencia en la oficina y una manera confiable de obtener documentos firmados y completados. Nos permite obtener documentos firmados y legítimos más rápido. Los documentos son más fáciles de procesar. "Works for what I need!!" I like that i can open it as easy as a click and then esign documents and get things done. makes work easy by nothaving to run and send a fax, just send an email. Its a breeze to type up a contract and sent it via email let the client esign the document and send it back with just an email. nothing. Its easy to use and i understood how it worked. It easy!! It will save time and money. Time by just esigning and emailing and it will save you money. no need to pay for faxes anymore. I use it every chance i get. We are solving the problem of esigning documents. makes it a breeze and saves a fax. saving my company time and money. I love how easy it is to get documents signed. It's also a great tool to help me keep track of what has and has not been signed. I like that the documents are digital through the entire process, saving time from scanning documents. I don't like that the active templates that I create aren't easy to find after 30 days. I have to use the advanced search function to make any modifications to my templates. What would be great is if there was a link to manage my templates on the landing page. If you have not used an electronic signature platform yet, what are you waiting for? Easily manage, track, and retain your documents. Adobe Sign has been so useful to me in Human Resources but I can recognize what a great tool the would be for most, if not all business processes that require signature validation. Adobesign has streamlined the recruiting and onboarding process significantly. I am able to require responses for forms that would be turned into me incomplete. I can quickly see and track which employees have not completed required forms without extensive tracking through worksheets. I also relied heavily on Adobe Sign when processing the payable requests for the accounting department. Considering we require review and signatures from individuals located in multiple offices or constantly on the road, Adobe Sign preserved document readability which nomrally degraded after several prints and scans. "Easy to Use, Clear UI"
Environmentally sound - less paper, the world is all digital now. I really love the signature tool and the program integration. Time saver. Some of the UI feels very old school. Could use an upgrade. Maybe a little more color splash. Quick back and forth with clients, saves lots of time. When I was job hunting last, there was many times I had to sign some documents before we could begin the interviewing process - adobe sign made what could of been a painful experience, a smooth one. "Simple to use and administer"
The set is very easy and you can add just about any document, then when sent to the person who needs to sign, again it is a very easy process. It's hard to find some negatives, but having a few templates in there would be a great help. Standard stuff like NDA's etc. Get you documents in place, when uploaded run tests to see how the customer will see them. We have solved some basic yet very important issues with this service, mainly getting NDA's signed and contracts during the sales process. It's very professional and clients are happy with the process. Hands down, my favorit feature pertains to the much simpler integration. You have the ability to tag a signature field in a form with the email address of the person who needs to sign it, and when you click the Send for Signature tool in Acrobat, that will be the email the form gets sent to. Pure genius! Sign app will only allow one signature per document. We also found that there is no help files or quality support available with use of multiple signatures per document. Pricing is high for infrequent use. It is slow to set up a contract to be signed and cannot be done in advance. The program identifies the signatory by their email address instead of by name. Tired of printing, signing, scanning, emailing, and archiving to PDF? This is the future of contract execution. This tool is great. Integration to Microsoft Office for content creation and easy execution with PDF archive. It is very helpful that Acrobat also includes an Office plugin that lets you send a document for signing from Word or PowerPoint. With the ability to take a photo and then sign them on-screen, the Sign apps make it a lot easier for us to deal with forms that aren't on paper and need a signature. The name Adobe, until now, for me, signified quality software. Photoshop, Acrobat are well known and high quality. They have a different support team for each product, but nobody managing the whole. Whey you call for support, the person seems to be listening for keywords that they can use to transfer you to another group. Example (real): I called Adobe Sign team and said, "I bought Acrobat and Adobe Sign, but now I can't see Adobe Sign in my Plans, I only see Acrobat." to which the technician replied, "I apologize for any problems you are experiencing sir. I see you are having a problem with Adobe Acrobat, may I please place you on a brief hold so that I can transfer you to the Adobe Acrobat group?" ... I explained several times that I only *mentioned* Acrobat and eventually they transferred me anyway. Don't do it. Adobe is a product purchaser and aggregator. They have grown faster than they're ability to support their products. If you don't need support you might be ok, until you do. Just don't do it. NONE! Since signing up with Adobe I have been charged unfairly, the products don't work, I've spent literally hours on the phone with no resolution. I am at my wits end with them. However, I signed up for Docusign and haven't had a single issue. Easy, fast, and stable. * We monitor all Adobe Sign reviews to prevent fraudulent reviews and keep review quality high. We do not post reviews by company employees or direct competitors. Validated reviews require the user to submit a screenshot of the product containing their user ID, in order to verify a user is an actual user of the product.